Ever since Questionmark started in the 1980s, one of our largest areas of use has been the financial services industry. Mitigating risk is key component of success for banks, insurance companies and others in financial services. 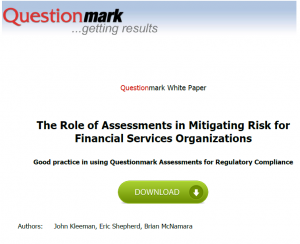 Assessments play a crucial role here, and many of the world’s leading financial services companies use Questionmark assessments to help mitigate risk. With colleagues, I’ve written a white paper on The Role of Assessments in Mitigating Risk for Financial Services Organizations. You can download the white paper, it’s free with registration. I’d like to thank several readers of this blog for their review and input into draft versions of the white paper. Mitigating risk is key component of success in the financial services industry. The risk of non-compliance is an obvious concern, but other risks abound, too – such as losing customers and/or good employees. Every organization defines processes to mitigate risk and maintain compliance, and it’s essential for employees to understand them and follow these processes. If they don’t, the risk of non-compliance increases. Training certainly helps, but without follow-up assessments there’s no proof that people have learned what they need to know. And organizations that can’t prove they have taken adequate steps to educate employees face higher non-compliance penalties. How can organizations ensure that employees have demonstrated competence in matters of regulatory compliance? Assessments play an essential role: Quizzes, tests and surveys are the most cost-effective way to confirm and document mandatory regulatory training. Whether required by regulators or not, assessments delivered online to employees are one of the few ways — and likely the best way — to touch individually on your entire workforce and ensure that people understand their roles in your business and what is required of them to meet regulatory and business needs. Effective assessments improve performance – making for happier customers and employees – while at the same time aiding compliance. Online assessments have long been used in compliance, but now more than ever. Most large companies today see online assessments as a critical part of their compliance programs. The paper explains why, by describing today’s regulatory landscape and showing the business benefits of using assessments to meet its demands. It also describes specific ways to use assessments within a compliance program, examines security and accessibility issues and offers role-specific best practice guidance for implementing a legally defensible assessment program. I hope the paper proves useful reading!